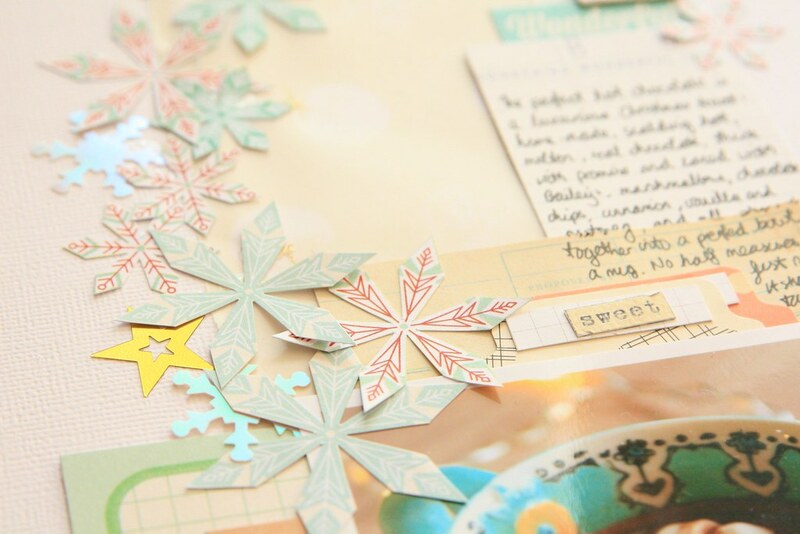 Today you can find me at Shimelle.com sharing a scrapbook page inspired by a layout made by Shimelle herself. 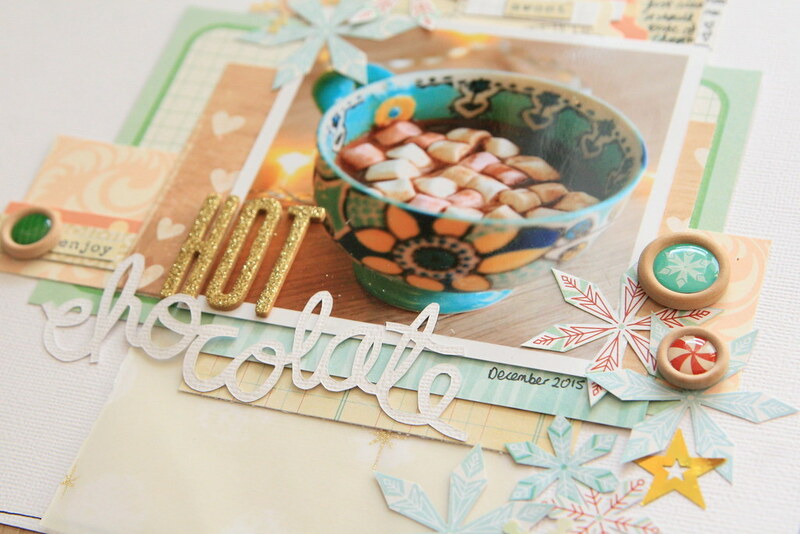 And of course, because the festive season is upon us, it's all about the perfect Christmas hot chocolate. Do you have a drinks that just taste like the seasons? Even though we are veering into spring, there's still a bit of a nip in the air and so I have been experimenting with the warming powers of a good hot chocolate. 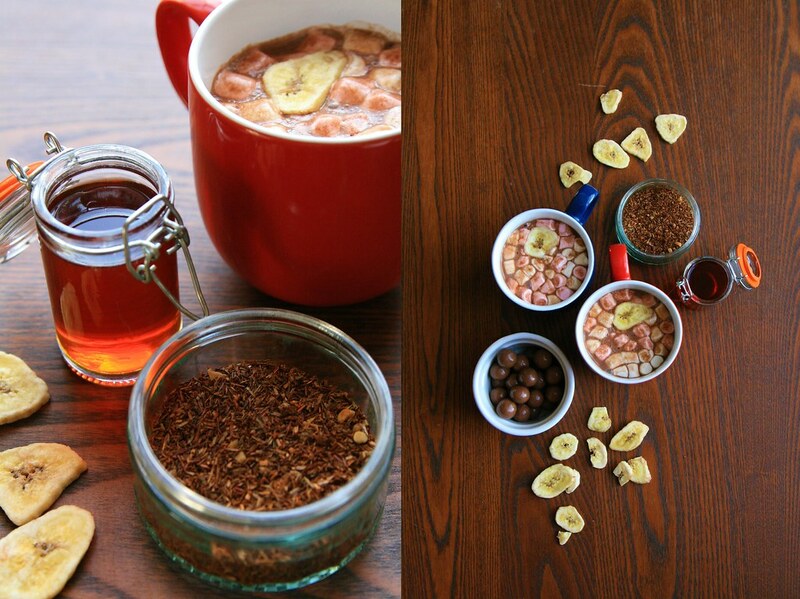 Hot chocolate is worth taking your time over: it's indulgent and satisfying and luxurious, and so to elevate this tasty beverage into something even more special, I want to share my recipe for hot chocolate with banana tea syrup, inspired by Bluebird Tea Co's Banana and Peanut Butter Pancake tea. First of all, to make the syrup you need only three simple ingredients: 1 cup of water, 1 cup of sugar and 5 teaspoons of your favourite leaf tea. Boil the water, and once it's reached the temperature needed, brew your tea. The Banana and Peanut Butter Pancake blend I used is a Rooibos tea which means it can be brewed at 100 degrees Celcius. 5 teaspoons is a lot for one cup of water, but to give the syrup real strength and depth of flavour, it is the right quantity. Leave the tea to brew for around 7-8 minutes. Again, this is a longer brewing time than you'd probably want for a cuppa, but useful to let the flavour overcome the sweetness of the syrup and the flavour of the hot chocolate. Once your tea is brewed, strain out the leaves, add your tea and the cup of sugar to a pan, and bring the mixture the boil. Stir occasionally, and boil for just long enough to allow the sugar to dissolve. Then remove the pan from the heat. Allow the syrup to cool; it will be runny so don't expect it to thicken particularly. This makes it easier to add to drinks. Once the syrup is cool, keep it in an airtight jar in the fridge. I made mine over a week ago, and it's still good! Next: the hot chocolate. It's always worth getting good quality hot chocolate, and fairly traded at that. None of your sugary instant stuff thank you; remember the syrup is going to add some sweetness anyway. 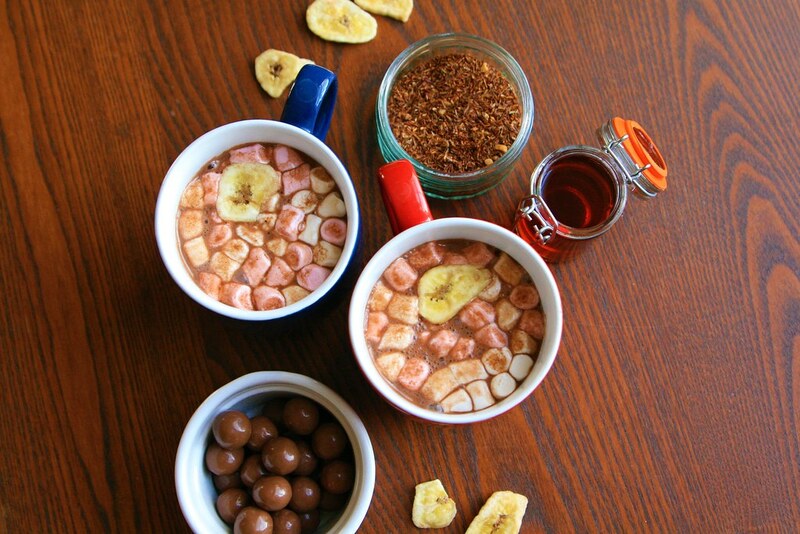 Make up the hot chocolate as you normally would. I used almond milk as I like the blend with the banana (plus it's dairy free). Anyway, it was quick work to heat a couple of mugs-worth of milk in a pan and whisk in the hot chocolate. When it's ready, you can stir in 2-3 dessert spoonfuls of syrup per person. 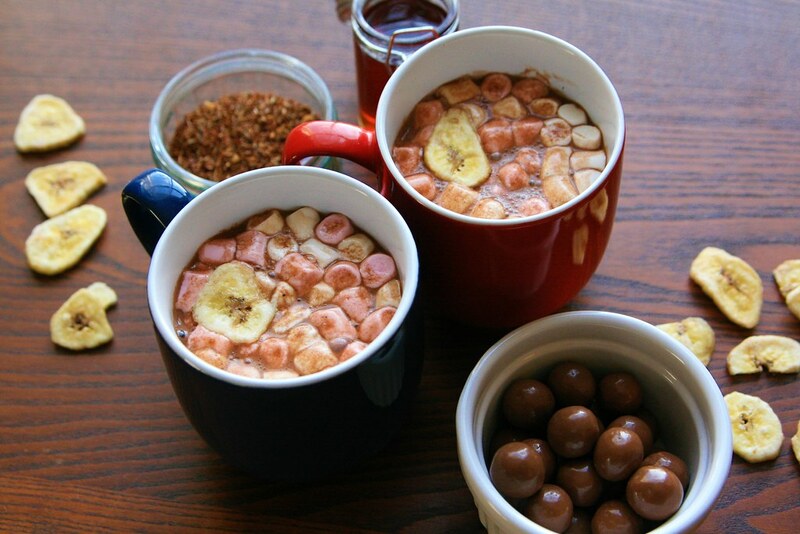 I added a handful of marshmallows to the bottom of two mugs and then divided the thick, creamy mixture between them. 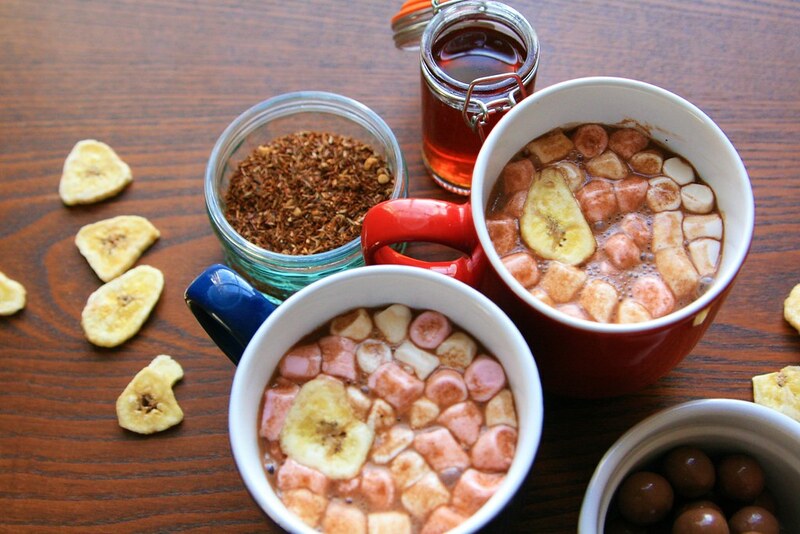 Pouring the chocolate over the marshmallows makes them a little bit melty and fuzzy round the edges. 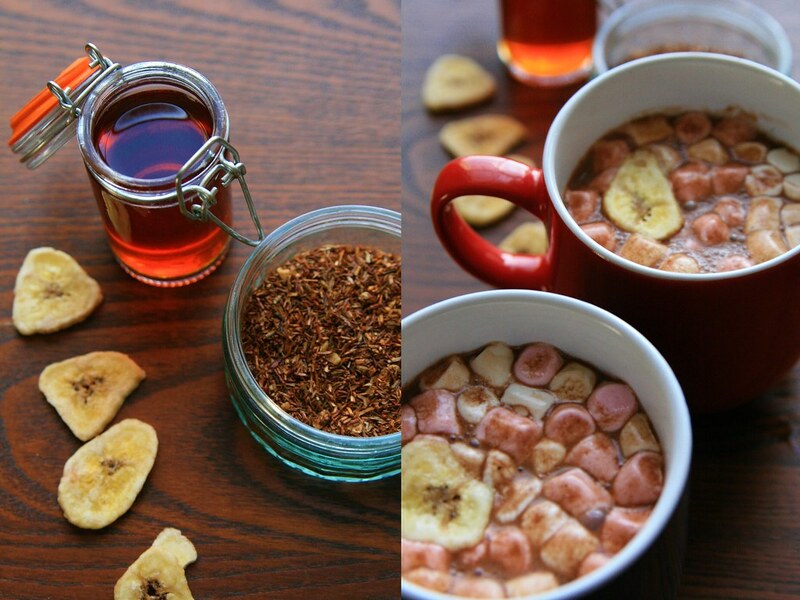 Finally, top with a banana chip and serve with tasty nibbles! In my case, that's maltesers and more dried banana chips. 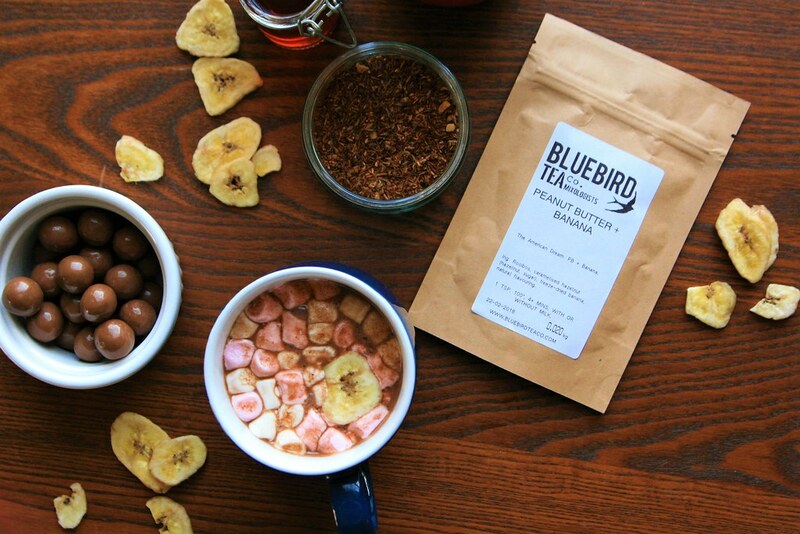 While I chose to make my syrup with the Banana Pancake tea, you could easily to this with any of your favourite brews, and Bluebird have a lot to choose from. Bears Like Marmalade will give you a lovely fruity, orangey flavour, and I'm excited to try making syrup with the Chocolate Digestives tea as well. 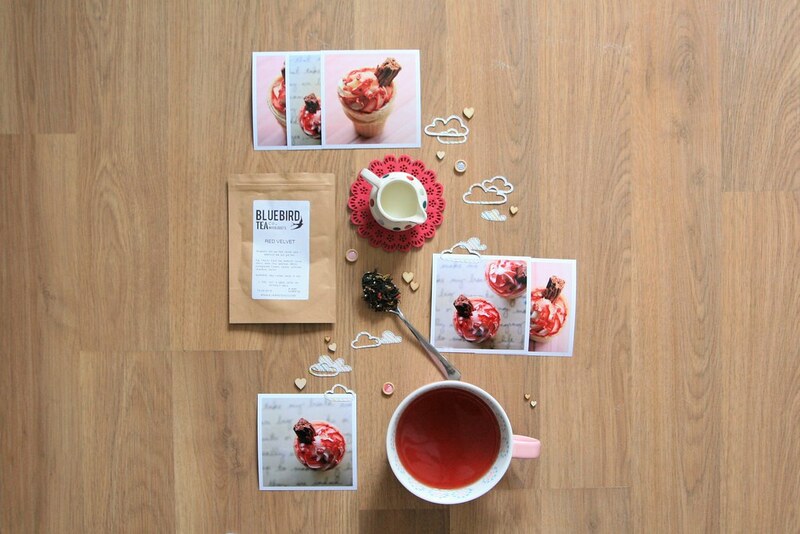 Not to mention that classic blend of Rooibos called Nuts About You which is packed full of wonderful almondy flavour. 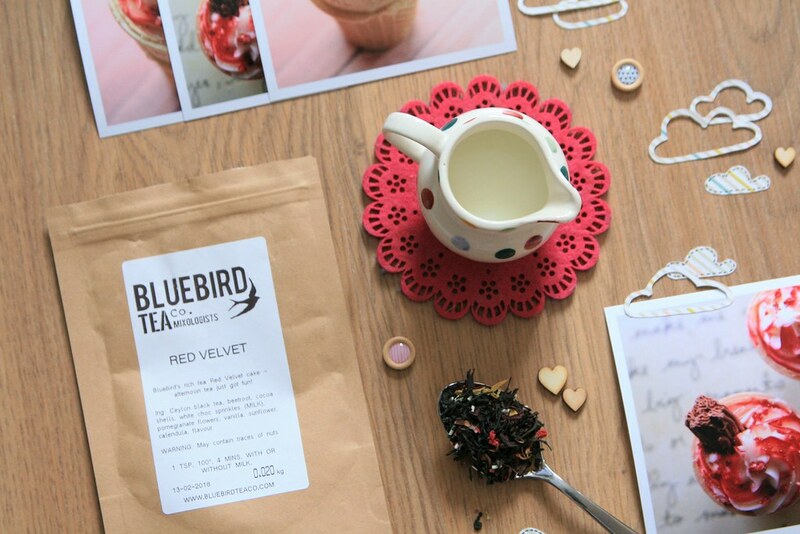 Towards the end of February, I was excited to find out that I had been selected to be a Tea Rep for the truly fabulous Bluebird Tea Co. 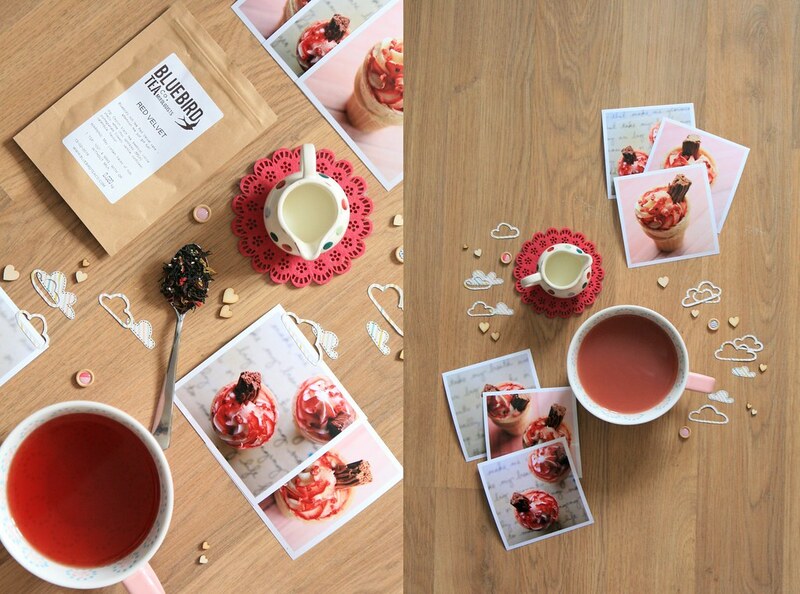 I first discovered this lovely independent company when I took part in one of their Tea Mixology workshops at their Brighton-based shop (you can read about my experience here) and since then, I have cheerfully swapped many a shiny penny for their delicious and wonderful teas. I sampled a whole range of their regular brews in their Advent Calendar (I hope they do one again this year!) and I have been merrily digging into their special edition teas whenever one takes my fancy. And if you fancy trying them too, scroll down to the end of this post for a discount code for 20% off your first order! 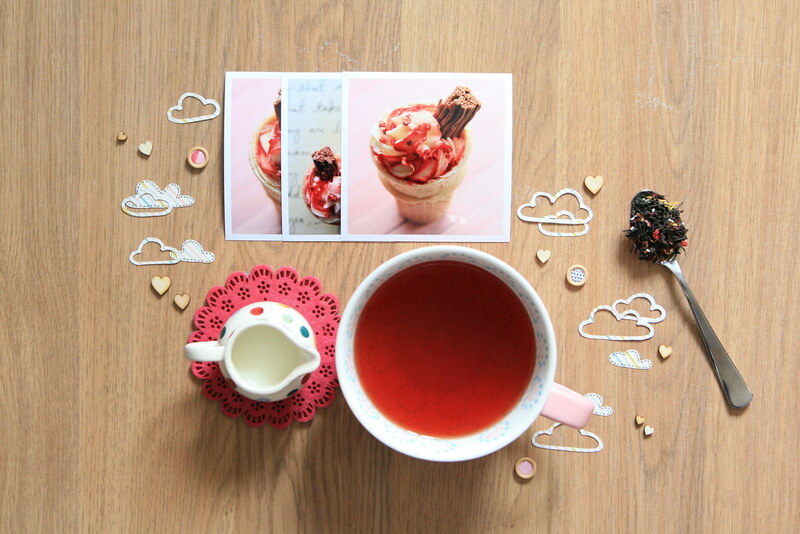 This particular tea is sadly no longer available (you have to jump on board pretty quickly to snap them up!) but is one of the February limited editions. It's called Red Velvet, and my goodness isn't it just! 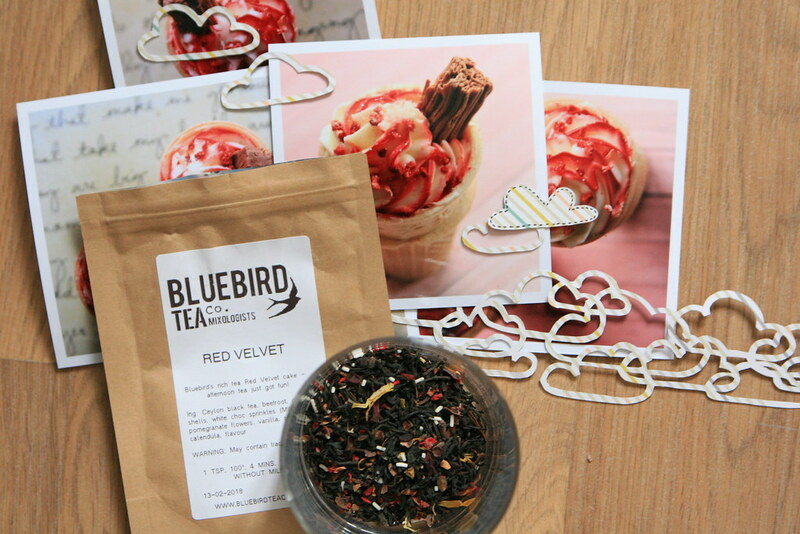 Red Velvet is a black tea but also contains cacao shells, white chocolate sprinkles, pomegranate flowers and beetroot to add flavour, and a distinctive deep red colour. And in flavour, it really is reminiscent of the cake! It's sweet without being sickly or overwhelming; as someone who doesn't take sugar in her tea, I definitely prefer things which aren't too saccharine. The chocolate provides and earthiness and depth to the favour which is very appealing, and the blend really worked for me. I would go so far as to say that it's yummy! 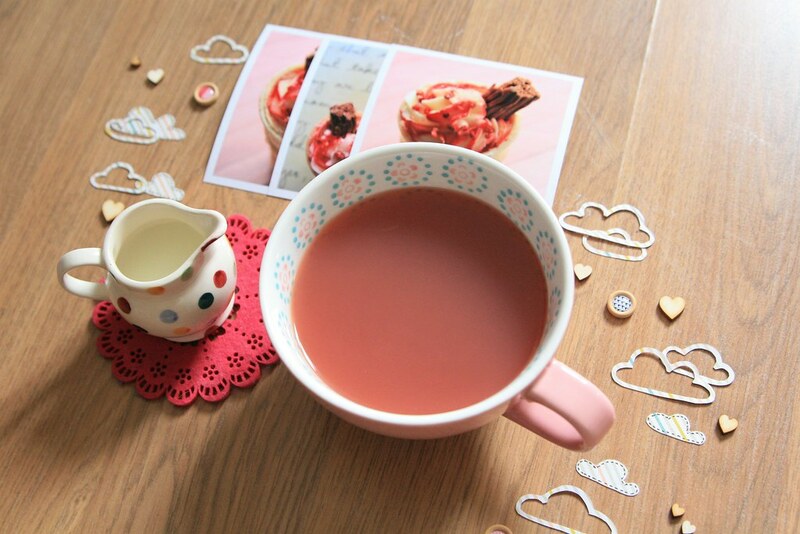 With an added splash of milk, the pink becomes even more pronounced; I actually really enjoyed the colour of this tea and it made me giggle! I always have a drop of milk in black teas as I like that little bit of creaminess and I think it can dull any bitterness that tea has. Not an issue with this particular blend, but I still liked it with milk anyway. To brew a perfect cup, the guidelines are one teaspoon of tea brewed in boiling water for 4 minutes. This gave a good strength to the cup without being overbrewed and as it's leaf tea, it won't get too strong. Leaf tea needs longer to steep than teabags do, and by using the right amount and brewing it properly for 4 minutes, you will have a lovely rounded flavour. 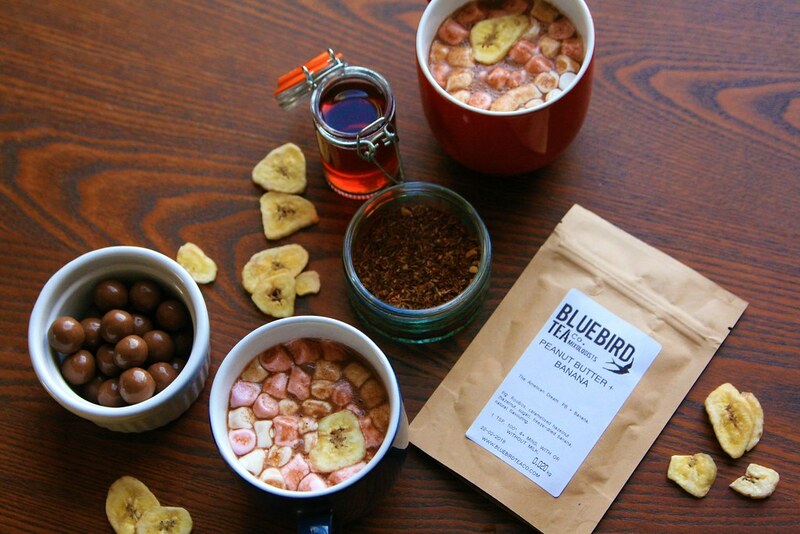 As a Tea Rep for Bluebird Tea Company, I can offer you a one-use-only 20% off discount code: just enter CURIOUSTEABIRD07 at checkout. And make sure you move quickly if you want to snaffle some of those special edition spring teas! P.S. One tea that has recently come my way is a very special Sticky Chai: a wonderful blend of tea and spices in honey which is genuinely sticky. And I have exciting plans for it! It has been a completely manic couple of weeks at Curious Headquarters: I have moved to a new place, hauling my stuff across London (with the much appreciated help of friends and family), I have written school reports for 5 classes, organised and run an International-themed weekend away in my role with Girlguiding (helped along this weekend with a terrific team of leaders), held a fundraiser for our Guide unit, and also simply had to attend important gatherings with friends involving meals out, cocktails and a wonderful evening trying on and selecting my bridesmaids dress for a friend's wedding. Let's just say there have been many nights spent burning the midnight oil followed by crack-of-dawn mornings. While there's been lots to love, I'm quite glad of a little break to actually unpack, gather my thoughts and catch up on a few extra winks of sleep. The upshot of this is that I fell of my own blog schedule for a week. But I'd like to get it back on track this week, stealing wifi from work until I get some into the flat. 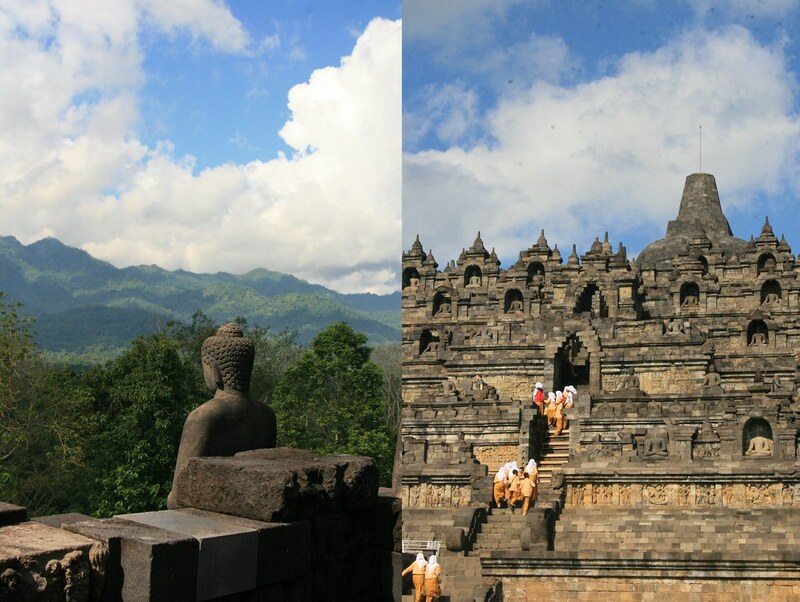 Therefore I bring you a little photo story of the time I visited the temple complex of Borobudur on the Indonesian island of Java. 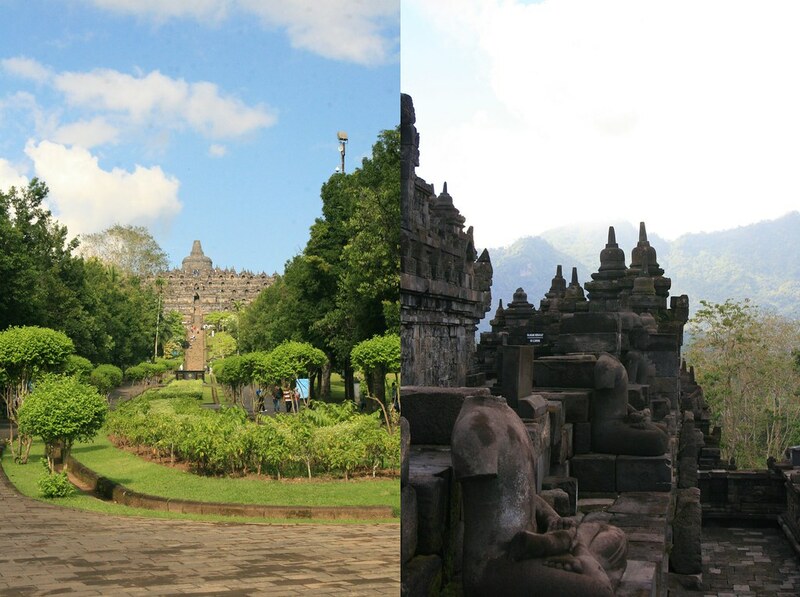 I visited Indonesia for a grand total of about 3 days back in 2015, but definitely managed to make the most of the time we had. 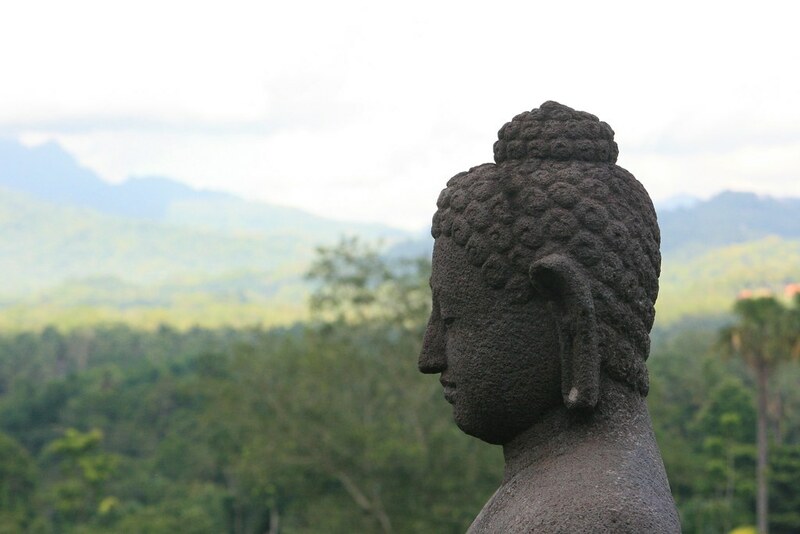 In that time, it was wonderful to visit Borobudur: a Buddhist temple complex that seemed aeons old, filled with a calm and spiritual beauty that made it very easy to understand why so many people visit. 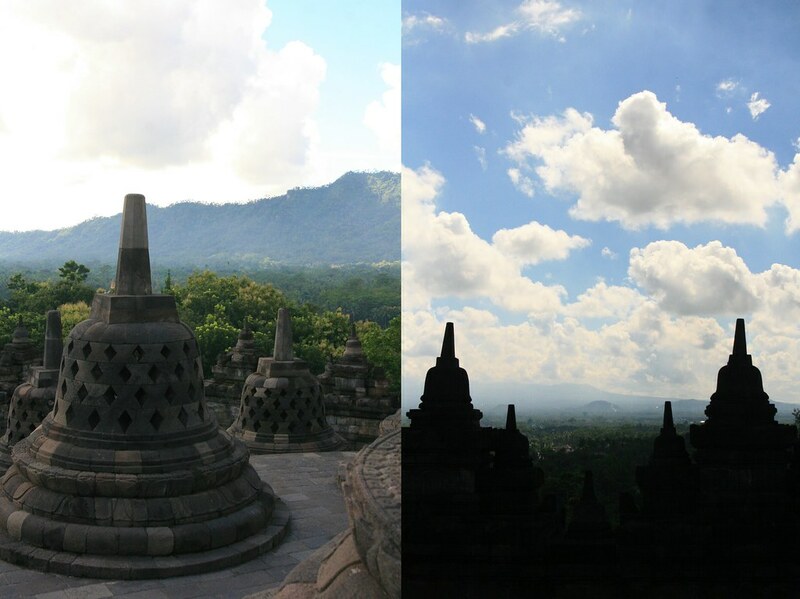 Borobudur was hidden from the world at large for much of its history. However it was brought to the attention of Sir Thomas Raffles, then British ruler of Java, in 1814. Efforts have been made to restore and preserve the 1200 year old temple, and it retains an otherworldly atmosphere of peace and mystery. 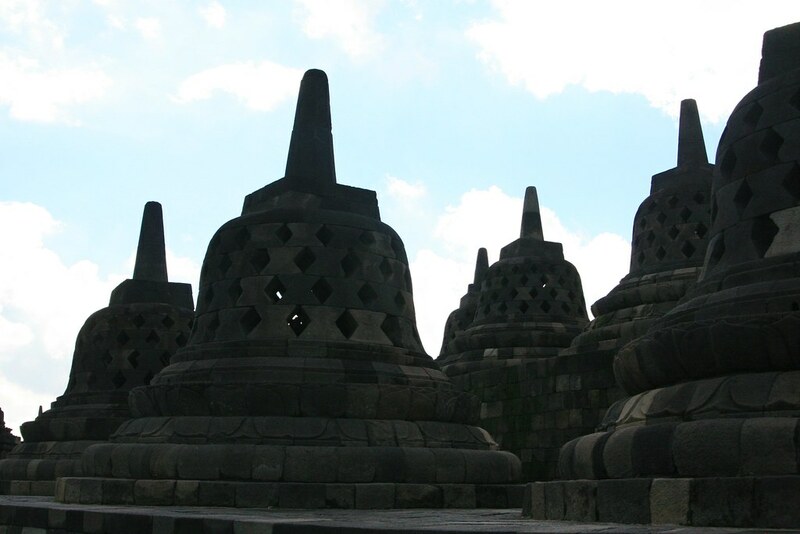 In fact, the history of Borobudur is really quite fascinating, and it was very interesting to have a Guide to share some of his knowledge. The climb to the top is no insignificant, but it was absolutely worth the effort in the humid climate. It was simply beautiful. 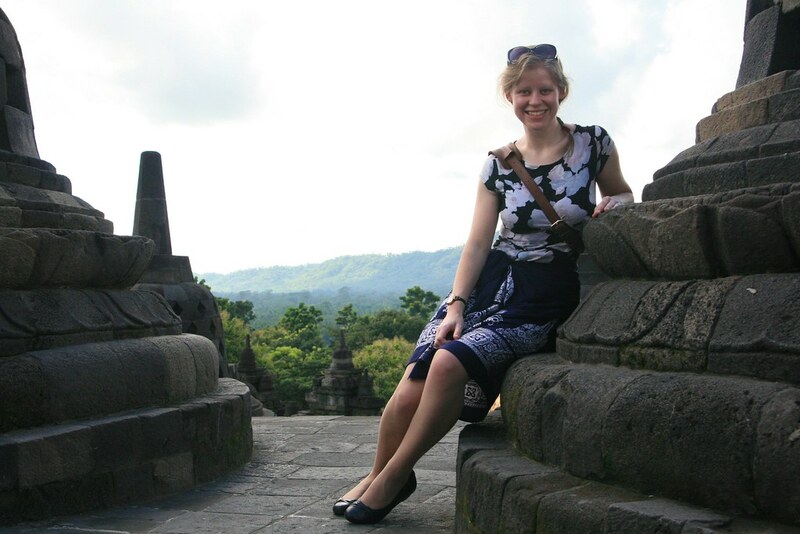 Each tier of the temple is crowned with stupa; bell-shaped stone structures containing Buddhist statues. 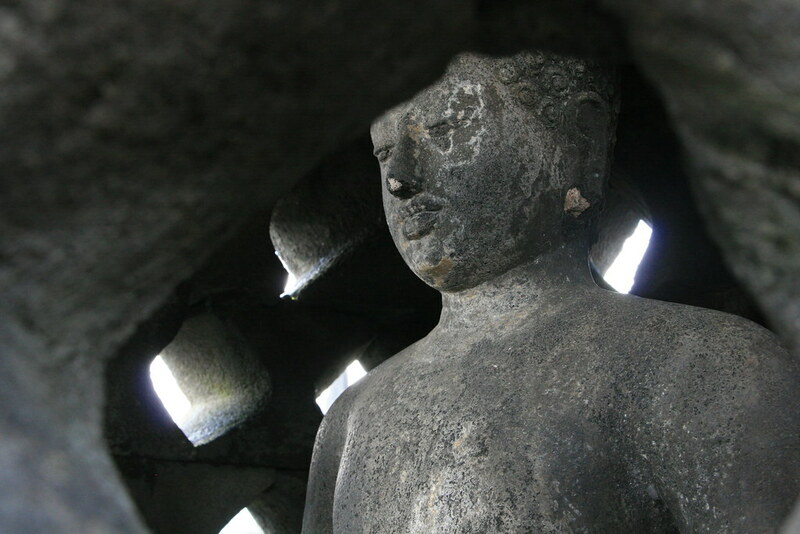 Each Buddha is seated in the lotus position, but the hands vary slightly from area to area within the temple. The stupa give the temple an incredibly distinctive silhouette. While we were exploring the upper levels of the temple, we were approached by a party of school girls; apparently they visit the temple looking for tourists so they can practise their English and were keen to do so on us. 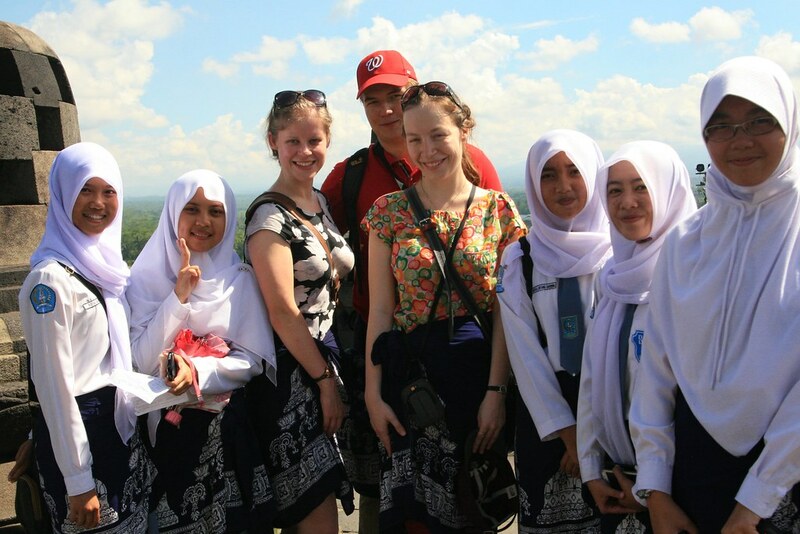 We were happy to oblige, but once they had done their duty and read out the requisite English sentences on their notes of paper, they were much more interested in taking selfies with us. It just goes to show that no matter where you are in the world, teenage girls are teenage girls. P.S. Hopefully newly scheduled programming is now restored to Journal of Curious Things. Although I must confess I'm definitely ready to have wifi back in my life. Only another couple of weeks to go! 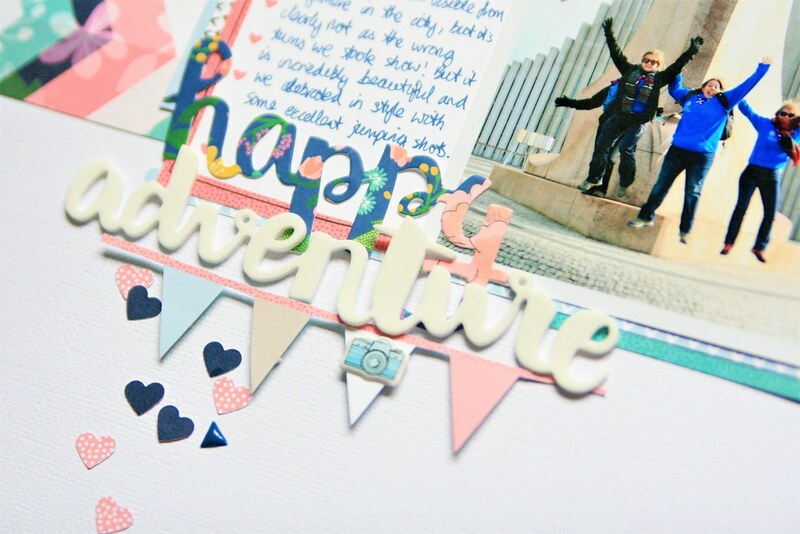 This week I'm sharing a project over on Shimelle.com, following the release of Little By Little, her new line of scrapbooking products with American Crafts. 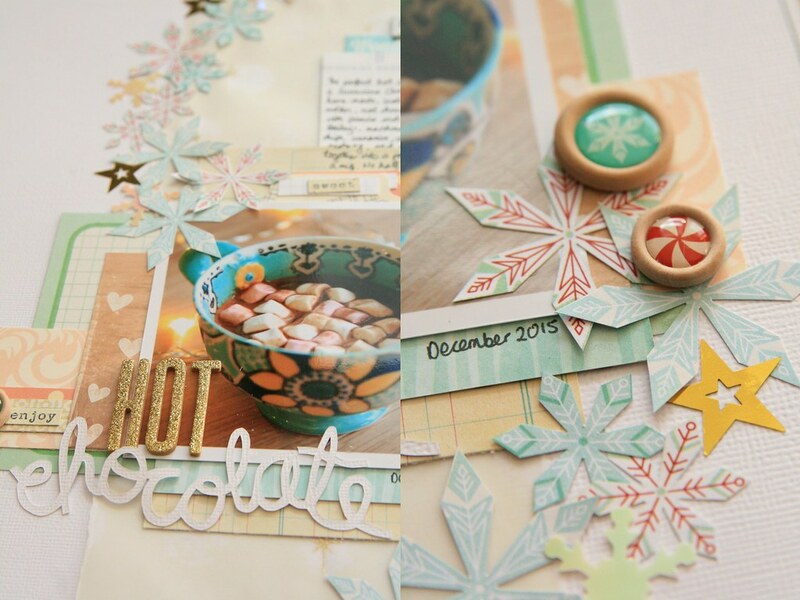 I have been fortunate enough to work with these lovely papers and embellishments and have had so much fun putting layouts together! One of the things I was most struck by was the versatility of the colour palette and designs. 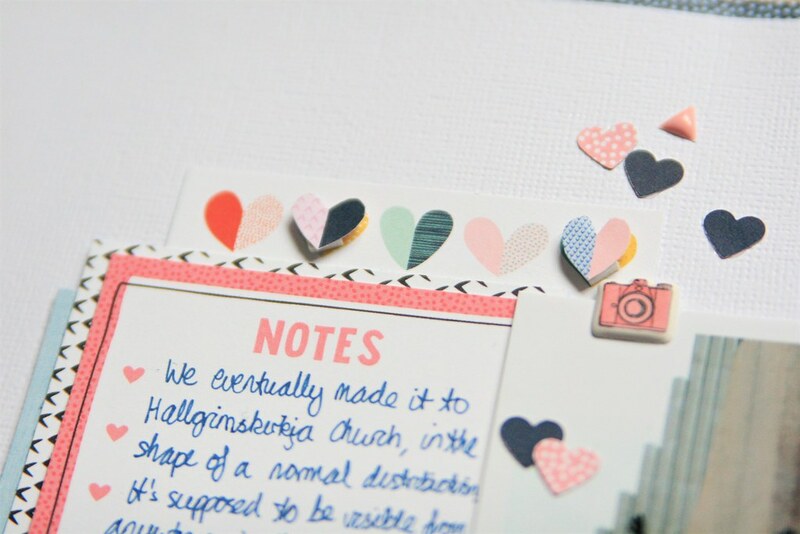 The collection contains whimsical icons and themes along with beautiful florals and some brilliant neutrals which make selecting supplies really easy. Little by Little can pretty much work for any topic or theme! Once again, it was an absolute treat to work with a collection from Shimelle (can I always have puffy camera stickers for everything please?) and you can find the full project shared here on Shimelle.com. It was lovely to look back and scrapbook some pictures from a Girlguiding county trip to Iceland, especially as I have two trips planned for this year with different groups. Can't wait!